Perform Wŏnbanjang to the right. Lift the left leg as high as possible, then center the left knee in front of the abdomen. 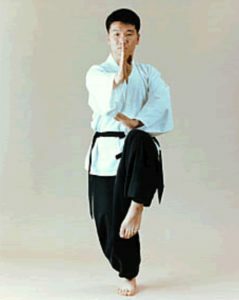 The left foot should be placed as straight forward as possible. Stretching the left ankle, place the tip of the left big toe on the right knee (the left knee should be held at the same height or as high as possible by the abdominal strength). The left leg should hold the body as low to the ground as possible. The gaze should be focused at the middle fingertip and the feet are firm against the floor with power focused at the toe tips.